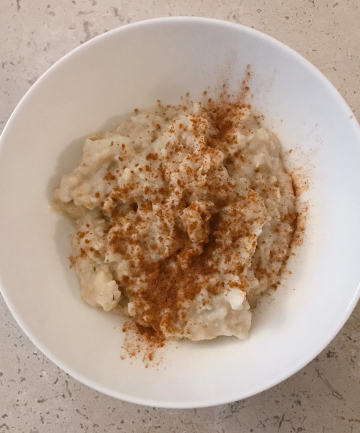 Egg White Oats Topped With Cinnamon, serves 1 Kate Lemere, instructor at Barry's Bootcamp: "This recipe is amazing for pre or post-workout fuel, or a satiating breakfast." Mix water and oats in a saucepan and place over medium heat, stirring frequently. When oats are nearly fully cooked (2-3 minutes), incorporate the egg whites, stirring continuously for another 60-90 seconds, or until egg whites are fully cooked. Top with cinnamon and enjoy the fluffiest, most satisfying oats you've ever had! Add Vital Proteins if you want an added boost of protein.